During cruise CD176 the SBE43 dissolved oxygen sensor was found to be damaged with a punctured membrane. Consequently the data originator flagged all data obtained with the sensor as unreliable. It should also be noted that a number of data values measured by the transmissometer exceed 100%. It is believed such values occurred due to the lenses on the instrument being fouled by an oil film. All values where transmittance exceeds 100% have been automatically flagged by BODC's screening software. The fluorescence channel suffers from excessive spiking as a result of a dissolved power pin caused by connector flooding in the Aluminium Break-Out Box. Consequently the extreme spikes that occur in the channel have been flagged and should be used with caution. In addition some negative values have occured and are considered to be a result of the calibrations applied, these values have been automatically flagged. A total of 66 CTD casts were performed during the cruise which sailed between Birkenhead and Falmouth via Rockall, Iceland and Oban incorporating the Extended Ellett Line and Wyville Thomson Ridge. 2 of the casts deployed during the cruise were housed in a titanium frame equipped with dual temperature and conductivity sensors. The CTDs were located within and near the bottom of the rosette frame which held 24 10-litre Niskin water sampling bottles. Following the completion of each CTD cast the data were saved to the deck unit PC and transferred over the network to a Unix data disk. On 16th October 2005 the Seabird CTD software on both master and slave deckunit PCs was upgraded to v5.35 following problems with crashing and this software was used to perform all subsequent processing steps. Raw data files were converted to engineering units and ASCII (.CNV) files using the DATCNV program. SeaBird bottle data files (.BTL), with information on pressure and other readings logged at the time of bottle firing, were also generated during the data conversion process. The WILDEDIT program was run to remove any large pressure spikes and then the SeaSoft program ALIGNCTD was run to advance the oxygen measurements. CELLTM was run, according to SeaBird's recommendations, to remove conductivity cell thermal mass effects from the measured conductivity and FILTER was run on the pressure channel. Salinity and density were calculated using the DERIVE program and TRANSLATE wrote the data to an output .CNV file. Following despiking of the data in MATLAB the program LOOPEDIT was run with a minimum CTD velocity of 0.25 m/s. Finally the data were binned to 2 db intervals using the BINAVERAGE program thus being formatted according to the WHP (WOCE Hydrographic Programme) standards. Due to only two casts taking place using the titanium CTD frame an insufficient number of samples were taken to use in the derivation of a calibration coefficient. The salinity data from the titanium CTDs therefore remain uncalibrated. Sherwin, T. A. et al, (2005). 'Cruise CD176 Birkenhead to Falmouth via Rockall, Iceland and Oban', Internal Report No 248, Scottish Association for Marine Science. The data arrived at BODC in a total of 65 ASCII, WHP (WOCE Hydrographic Program) standard files with 2 of these files representing CTD casts from the titanium frame deployed during the cruise. These files contain 2 db-bin averaged data including temperature, salinity and dissolved oxygen channels processed to WOCE standards alongside concurrent fluorometer and transmissometer data. The Northern Seas describes an area extending from the Irish and northern North Sea across the Norwegian Sea up to the marginal Arctic pack-ice zone, including territorial waters of the UK, Norway, Iceland, Denmark and Russia. These waters are an important marine environment playing a significant part in regulating world climate due to the area's role in thermocline circulation in addition to acting as a sink for man-made pollutants carried north by ocean currents. These environments are experiencing increasing pressures from both natural and human impacts and consequently the Northern Seas Programme was developed to help advance the understanding of how marine systems in Northern Seas respond to environmental and anthropogenic change. The central aim of the programme was to 'improve understanding of how the sensitivity of marine ecosystems to environmental perturbation, both natural and anthropogenic, varies along a latitudinal gradient'. The Northern Seas Programme was active between 2001 and 2007. The fieldwork programme to address these objectives was conducted by staff from the Scottish Association for Marine Science (SAMS). What are the roles of physical submarine features (seamounts, banks and depressions) in driving carbon flow through the benthic biosphere at the northern European continental margin? To what extent do benthic faunal composition and size structure determine processes of carbon dynamics and biogeochemical provinces at the benthic boundary? 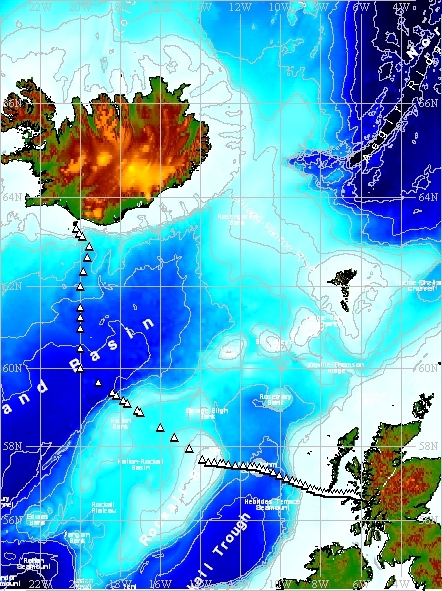 The Ellett Line aims to regularly monitor the transport of water, heat and salt between Mull and Rockall. The effects of fisheries on deep-water ecosystems will be addressed through the construction of food-web models. Station IB16 is one of the fixed CTD stations, which together form The Extended Ellett Line. The line lies between Iceland and the Sound of Mull (Scotland) crossing the Iceland Basin and Rockall Trough via the outcrop of Rockall. As part of this initiative, CTD dips, together with associated discrete sampling of the water column, have typically been carried out annually at this station since September 1996.